Women spend an average of $50,000 on their hair over their lifetimes, so clearly, hair is a big deal. It helps us define who we are and how we want others to perceive us. What happens when a woman's hair disappears? Most people assume that a bald woman is dealing with chemotherapy, but that often is not true. For women with alopecia areata (AA), baldness may be a lifelong reality. 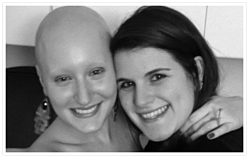 What's Happening in the Lives of Women With Alopecia Areata? Fear of Rejection. It's less taboo for a man to be bald. For women though, it's a different matter entirely. Female baldness is a very sensitive issue. It causes feelings of intense vulnerability, and you may wonder if you can trust others with your secret. Fear of rejection is very real for women with alopecia areata, and that fear can extend to people in all areas of your life: from the cashier at the grocery store to your husband. Altered Self-Image. When you lose your hair, your self-image can be drastically altered. Some women deal with this problem as children and must cope with it from a very young age. Some aren't affected by alopecia areata until well into adulthood. At any stage, though, baldness can affect the way you see yourself and undermine your confidence. Isolation. Instead of constantly explaining your condition and clearing up rumors that you have cancer, you may find yourself isolating yourself from others. While isolation may seem better than being stared at, it leads to a new set of problems: loneliness, lack of support, and depression. Expenses. Many health insurance plans don't cover the cost of wigs or cranial prosthetics, so women with alopecia areata have to choose between spending lots of money, compromising on quality and feeling exposed to stares. Extra expenses can create financial stress or even guilt when your condition costs so much. Self-Consciousness. People stare when they see something out of the norm, and women with alopecia areata often find themselves the objects of others' attention. This can be incredibly frustrating when all you want to do is fit in and live a normal life. Feelings of Hopelessness. Since there isn't an effective cure for alopecia areata, feelings of hopelessness can set in, especially when a woman doesn't have a good support group. You may experience times when everything seems fine, and then an insensitive comment can throw you into a tailspin. What's a woman with alopecia areata to do? Family and friends can quickly get burned out from hearing about your hair loss problems, but there are women like you in your area who know exactly what you're going through and can give you good advice. Bald Girls Do Lunch offers women a social environment where they'll never feel strange, different, or alone. When you build relationships with other women with alopecia areata, you'll have a support group you can count on for good advice, heartfelt empathy, and a more positive outlook on life. You'll be able not only to receive support but also to offer it to women who need the help that only you can give.